Forest wildfires are a natural part of many of California’s forest ecosystems. The Sierra Nevada mixed conifer forest, for example, has adapted over time to frequent, low intensity fires that burned every 10 years or so. Fires were naturally set by lightning or ignited by native Americans. Today, forest landowners and managers have varied strategies for dealing with wildfires. For example, the National Park Service has a mission to restore and maintain natural processes like wildfire and therefore will manage wildfires that ignite and burn under benign conditions, rather than suppress them immediately. On the other hand, private forest landowners view uncontrolled wildfire as a threat to their timber resources or homes, and so usually want wildfires suppressed as quickly as possible. Other potential options for landowners is implementing prescribed fires or fuels reduction treatments. The eXtension Wildfire Information Network is an interactive learning environment delivering the best, most researched knowledge from the smartest land-grant university minds across America. The California Fire Science Consortium is dedicated to improving the quality and timeliness of two-way movement of fire science information between scientists, land managers, and stakeholders in the state’s fire community. Goals are to become a clearinghouse for all fire science resources relevant to the regions within the state of California, and to encourage collaboration between fire researchers and land managers and other stakeholders. Along these lines, we hope to make this website a centralized resource that can be used to both get access to and to better understand fire science, as well as to open new channels of communication and encourage the creation of applicable science. California Fire Safe Council –The Fire Safe Council mobilizes Californians to protect their homes, communities and environments from wildfire by providing resources for establishing and maintaining local Fire Safe Councils, such as the FSC Handbook, nonprofit and funding information. The website can help you locate the fire safe council near you. CalFIRE – The California Department of Forestry and Fire Protection or CalFire is the state's agency in charge with responding to wildland fires, provide training education and certification programs for the California Fire Service, and law and code enforcement and education. 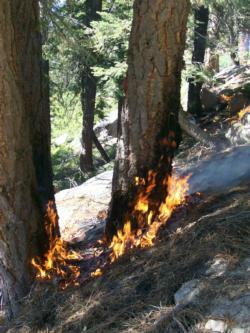 CalFIRE published an issue of the Forestland Stewards Newsletter on the 2007 Angora Fire - Lessons Learned in Spring 2010. Maps of fire history, fire perimeters, and fuels - This like provides access to maps that show fuel and fire distributions in California. You can delineate the area you are interested in or use a pulldown menu of counties. Forest Health and Carbon Storage in the Sierra Nevada - System Indicators: A final report to the Sierra Nevada Conservancy, December 2012. This reports on the status of Sierra Nevada forests from the standpoint of health, fire and carbon storage.